Fairport Convention are a British folk rock band, formed in 1967 by Richard Thompson (guitar, vocals), Simon Nicol (guitar, vocals), Ashley Hutchings (bass guitar), and Shaun Frater (drums, percussion), with Frater replaced by Martin Lamble after their first gig. They started out heavily influenced by American folk rock and singer-songwriter material, with a setlist dominated by covers of Bob Dylan and Joni Mitchell songs and a sound that earned them the nickname “the British Jefferson Airplane.” Vocalists Judy Dyble and Iain Matthews joined them before the recording of their self-titled debut in 1968; afterwards, Dyble was replaced by Sandy Denny, with Matthews leaving during the recording of their third album. Denny began steering the group towards traditional British music for their next two albums, What We Did on Our Holidays and Unhalfbricking (both 1969;) the latter featured fiddler Dave "Swarb" Swarbrick, most notably on the song A Sailor's Life, which laid the groundwork for British folk rock by being the first time a traditional British song was combined with a rock beat. However, shortly before the album's release, a crash on the M1 killed Lamble and Thompson's then-girlfriend, Jeannie Franklyn; this resulted in the group retiring most of their prior material and turning entirely towards British folk music for their seminal album Liege & Lief, released the same year, with this style being the band's focus ever since. For this album Swarb joined full-time alongside Dave Mattacks on drums. Both Denny and Hutchings left before the year's end; the latter replaced by Dave Pegg, who has remained the group's sole consistent member to this day; and Thompson would leave after the recording of 1970's Full House. The 1970s saw numerous lineup changes around the core of Swarb and Pegg, with Nicol absent for the middle of the decade, and declining fortunes as folk music fell out of mainstream favour. Denny, whose partner Trevor Lucas had been a guitarist in the group since 1972, returned for the pop-orientated Rising for the Moon in 1975 in a final bid to crack America; this effort failed, and after three more albums minus Denny or Lucas the group disbanded in 1979. They played a farewell concert in the village of Cropredy, Oxfordshire, where they’d held small concerts since 1976, and this marked the beginning of the Cropredy Festival (Fairport's Cropredy Convention post-2005) which has become the largest folk festival in Britain, with annual attendance of 20,000. The band was reformed by Nicol, Pegg, and Mattacks in 1985, joined by Maartin Allcock (guitar, vocals) and Ric Sanders (fiddle, keyboards,) and they have remained active since. Allcock was replaced by Chris Leslie in 1996, and Gerry Conway replaced Mattacks in 1998, with this lineup remaining unchanged since and marking the longest-lasting of the group's history. Their 28th studio album, 50:50@50, released to mark their 50th anniversary, was released in 2017, and they continue to headline Cropredy each year. Despite little mainstream success – with their only top 40 single being Si Tu Dois Partir, a French-language cover of the Dylan song If You Gotta Go, Go Now from Unhalfbricking – Fairport Convention remain highly influential in British folk rock and British folk in general. Liege & Lief was named the "Most Influential Folk Album of All Time" at the BBC Radio 2 Folk Awards in 2006, and Pegg's playing style, which incorporates jigs and reels into his basslines, has been imitated by many in the folk rock and folk punk genres. Additionally, many former members went on to form other notable groups in the genre, including Fotheringay, Steeleye Span, and the Albion Band; along with solo careers, most notably Thompson and Denny. Hers ended with her death in 1978, though she is now regarded as Britain's finest female singer-songwriter, and her song Who Knows Where the Time Goes? – recorded by Fairport on Unhalfbricking – has become a signature for herself and the band. Bassist Ashley Hutchings met guitarist Simon Nicol in North London in 1966 when they both played in the Ethnic Shuffle Orchestra. They rehearsed on the floor above Nicol's father's medical practice in a house called "Fairport" on Fortis Green in Muswell Hill – the same street on which Ray and Dave Davies of the Kinks grew up. The house name lent its name to the group they formed together as Fairport Convention in 1967 with Richard Thompson on guitar and Shaun Frater on drums. After their initial performance at St Michael's Church Hall in Golders Green on 27 May 1967, they had their first of many line-up changes as one member of the audience, drummer Martin Lamble, convinced the band that he could do a better job than Frater and replaced him. They soon added a female singer, Judy Dyble, which gave them a distinctive sound among the many London bands of the period. After disappointing album sales they signed a new contract with Island Records. Before their next recording Judy Dyble was replaced by the band with Sandy Denny, a folk singer who had previously recorded as a soloist and with Strawbs. Denny's distinctive voice, described by Clive James as ‘open space, low-volume, high-intensity’, is one of the characteristics of two albums released in 1969: What We Did on Our Holidays and Unhalfbricking. These recordings marked the growth of much greater musicality and song-writing ability among the band. The first of these featured the Thompson-penned "Meet on the Ledge", which became their second single and eventually the band's unofficial anthem. During the recording of Unhalfbricking, Matthews left after having sung on only one song, eventually to form Matthews Southern Comfort. He was not replaced; the other male members covered his vocal parts. The album featured a guest appearance by Birmingham folk fiddler Dave Swarbrick on a recording of "A Sailor's Life", a traditional song brought to the band by Denny from her folk club days. The recording of this track marked an important turning point for the band, sparking an interest in traditional music in Ashley Hutchings that led him to detailed research in the English Folk Dance and Song Society Library at Cecil Sharp House; this theme would become the basis for their next, much more ambitious, recording project. These two albums began to gain the band wider recognition. Radio DJ John Peel championed their music, playing their albums on his influential BBC shows. Peel also recorded a number of sessions which were later released as the album Heyday (1987). They enjoyed some mainstream success when they entered the singles charts with "Si Tu Dois Partir", a French-language version of Bob Dylan's "If You Gotta Go, Go Now". The record just missed the top twenty, but secured the band a slot on Top of the Pops, Britain's most popular television pop music programme at the time. In 1969 four members of the band, one uncredited and three with pseudonyms, featured as backing musicians on the album Love Chronicles by Scottish folk artist Al Stewart. On 12 May 1969, on the way home from a gig at Mothers, a club in Birmingham, Fairport's van crashed on the M1 motorway. Martin Lamble, aged only nineteen, and Jeannie Franklyn, Richard Thompson's girlfriend, were killed. The rest of the band suffered injuries of varying severity. They nearly decided to disband. However, they reconvened with Dave Mattacks taking over drumming duties and Dave Swarbrick, having made contribution to Unhalfbricking, now joined as a full member. Boyd set the band up in a rented house in Farley Chamberlayne near Winchester in Hampshire, where they recuperated and worked on the integration of British folk music into rock and roll that would result in the fourth album Liege & Lief. Usually considered the highpoint of the band's long career, Liege & Lief was a huge leap forward in concept and musicality. The album consisted of six traditional tracks and three original compositions in a similar style. The traditional tracks included two sustained epics: "Tam Lin", which was over seven minutes in length, and "Matty Groves", at over eight. There was a medley of four traditional tunes, arranged, and, like many of the tracks, enlivened, by Swarbrick's energetic fiddle playing. The first side was bracketed by original compositions "Come all ye" and "Farewell, Farewell", which, in addition to information on the inside of the gatefold cover on Hutchings’ research, explaining English folk traditions, helped give the record the feel of a concept album. "Farewell, Farewell" and the final track "Crazy Man Michael", also saw the full emergence of the distinctive song writing talent of Thompson that was to characterize his contributions to the band and later solo career. The distinctive sound of the album came from the use of electric instruments and Mattacks’ disciplined drumming with Swarbrick's fiddle accompaniment in a surprising and powerful combination of rock with the traditional. The entire band had reached new levels of musicality, with the fluid guitar playing of Thompson and the ‘ethereal’ vocal of Denny particularly characteristic of the sound of the album. As the reviewer from AllMusic put it, the album was characterised by the ‘fusing [of] time-worn folk with electric instruments while honoring both’. A few British bands had earlier experimented with playing traditional English songs on electric instruments, (including Strawbs and Pentangle), but Fairport Convention was the first English band to do this in a concerted and focused way. Fairport Convention's achievement was not to invent folk rock, but to create a distinctly English branch of the genre, which would develop alongside, and interact with, American inspired music, but which can also be seen as a distinctively national reaction in opposition to it. Liege & Lief was launched with a sell-out concert in London's Royal Festival Hall late in 1969. It reached number 17 in the UK album chart, where it spent fifteen weeks. Disagreements arose about the direction of the band in the wake of this success. Ashley Hutchings wanted to explore more traditional material and left to form two groups that would rival Fairport for significance in English folk rock: Steeleye Span and the Albion Band. Sandy Denny also left to found her own group Fotheringay. Dave Pegg took over on bass guitar and has been the group's one constant ever since, in an unbroken membership of over four decades. The band made no serious attempt to replace Denny, and, although she would briefly return, the sound of the band would now be characterized by male vocals. Despite these changes the band produced another album, Full House (1970), which was remarkably successful as a project. Like its predecessor, it combined traditional songs, including a powerful rendition of "Sir Patrick Spens", with original compositions. The latter benefited from the writing partnership of Thompson and Swarbrick, most obviously on ‘Walk Awhile’ which would become a concert favourite. Despite the loss of Denny the band still possessed four vocalists, including the emerging voices of Nicol and Swarbrick, whose tones would dominate the sound of this period. It was favourably reviewed in Britain and America, drawing comparisons with the Band from Rolling Stone magazine who declared that ‘Fairport Convention is better than ever’. The album reached number 13 in the UK Chart and stayed in the chart for eleven weeks. The same year the band released a single 'Now Be Thankful' and made its American debut, touring with Traffic and Crosby, Stills, Nash & Young. In the recurring pattern, soon after the album's release Thompson left the band to pursue other projects and eventually his solo career. This left Simon Nicol as the only original member and Dave Swarbrick emerged as the leading force in the band. In 1970 the members and their families had moved into The Angel, a former pub in Hertfordshire and this inspired the next album Angel Delight (1971) the band's first to chart in the US, peaking at number 200 on the Billboard 200 and their only top ten album in the UK. The next project was an ambitious folk-rock opera developed by Swarbrick, based on the life of John 'Babbacombe' Lee, ‘the man they couldn’t hang’ and released with the title Babbacombe Lee (1971). The concept format, originally without clear tracks, excited considerable press interest and it received good air play in the United States where it reached number 195. A version was produced by the BBC for TV in 1975 with narration by Melvyn Bragg. These two albums were also notable as the first time that Fairport had recorded consecutively with the same line-up, but inevitably stability did not last: Simon Nicol left early in late 1971 to join Ashley Hutchings' Albion Band and he was soon followed by Mattacks. Only Pegg and Swarbrick remained and the following few years have been dubbed 'Fairport confusion' as a bewildering sequence of band members came and went, but by 1973 Mattacks had returned and two former members of Sandy Denny's Fotheringay had joined the band, Denny's Australian husband Trevor Lucas on vocals and guitar and American Jerry Donahue on lead guitar. From these line-ups the band produced two studio albums: Rosie, notable for the Swarbrick penned title track (1973) and Nine (1974), the ninth studio album by the band. The last of these contained writing contributions by Lucas to five of the nine tracks, which together with Donahue's country influences and outstanding guitar pyrotechnics gave the album a very distinctive feel. Denny rejoined the band in 1974 and there were considerable expectations, both artistic and commercial, placed on this line-up. Denny was featured on the album Rising for the Moon (1975), which became the band's highest US chart album when it reached number 143 on the Billboard 200 and the first album to reach the top one-hundred in the UK since Angel Delight, reaching no 52. During the Rising sessions, Mattacks fell out with producer Glyn Johns and was replaced by former Grease Band drummer Bruce Rowland. Poor UK sales for Rising did not aid morale and, despite the relative success of the line-up, Lucas and Donahue left the band, as did Denny in 1976. She died aged 31, in 1978, of a cerebral haemorrhage after falling down a flight of stairs. Rowland, Pegg, and Swarbrick fulfilled their remaining contractual obligations to Island Records by turning what had originally been a Swarbrick solo effort into the album Gottle O'Geer (1976) under the name 'Fairport' (as opposed to Fairport Convention) in the UK, and as 'Fairport featuring Dave Swarbrick' in the US, and with various session players and production by Simon Nicol, who subsequently rejoined the band. They then signed with Vertigo, but record sales continued to decline and after producing two of four contracted albums, The Bonny Bunch of Roses (1977) and Tipplers Tales (1978), Vertigo bought them out of their contract. It is claimed by members of the band that this was the only recording money they had seen up to that point. By 1979 the mainstream market for folk rock had largely disappeared, the band had no record deal and Dave Swarbrick had been diagnosed with tinnitus which made loud electric gigs increasingly difficult. Fairport decided to disband. They played a farewell tour and a final outdoor concert on 4 August in Cropredy, the Oxfordshire village where Dave and Christine Pegg lived. The finality of this occasion was mitigated by the announcement that the band would meet for a reunion. No record company wanted to release the live recordings of the tour and concert, so the Peggs founded Woodworm Records, which would be the major outlet for the band in the future. Members continued to take part in occasional gigs, particularly in festivals in continental Europe, and after a year they staged a reunion concert in Cropredy which became the annual Cropredy Festival. Over the next few years, it grew rapidly and emerged as the major mechanism for sustaining the band. In August 1981, the band held their annual reunion concert at Broughton Castle, rather than the usual Cropredy location. The concert was recorded, and released on the 1982 album Moat on the Ledge. The Peggs continued to record and release the Cropredy concerts as 'official bootlegs'. These were supplemented by New Year's gigs in minor locations including the Half Moon at Putney and the Gloucester Leisure Centre. In 1983 the magazine Fairport Fanatics (later Dirty Linen), was created: a testament to the continued existence of a dedicated fan base. The remaining members pursued their own lives and careers outside of the band. Nicol, Pegg, and Mattacks had recorded and toured with Richard and Linda Thompson at times in the 1970s, and did so again during this period, culminating in their appearance on the Shoot Out the Lights album and tour in 1982. Bruce Rowlands gave up the music business and moved to Denmark and as a result Dave Mattacks returned as drummer for Fairport's occasional gigs. Dave Pegg was the first of several Fairporters to join Jethro Tull which gave him well-paying steady employment. Simon Nicol had teamed up with Dave Swarbrick in a highly regarded acoustic duo, but this partnership was made difficult by Swarbrick's sudden decision to move to Scotland, where, from 1984 he began to focus on his new project Whippersnapper. In 1985, Pegg, Nicol and Mattacks found that they all had some free time and an available studio belonging to Pegg. They decided that they needed some new material to add to the catalogue that had been suspended in 1978. As Swarbrick was unavailable, the selection of traditional tunes was more difficult than for past albums and there was a need for a replacement fiddle player and some vocals. Pegg and Nicol took over arranging duties on an instrumental medley and the band turned to sometime Albion Band members: jazz and folk violinist Ric Sanders and singer-songwriter Cathy Lesurf. They also had the help of ex-member Richard Thompson. Thompson and Lesurf contributed songs and took part in the recordings. Also important to the album was Ralph McTell who contributed one song and co-wrote one track each with Nicol and Mattacks. The former, ‘The Hiring Fair’, would become a stage fixture of the future Fairport. The resulting album Gladys' Leap (1985) was generally well received in the music and national press, but caused some tension with Swarbrick who refused to play any of the new material at the 1985 Cropredy Festival. Nevertheless, the decision to reform the band, without Swarbrick, was taken by the other three remaining members. Ric Sanders was invited to join, along with guitarist, composer, arranger and multi-instrumentalist Maartin Allcock. Nicol, with his developing baritone voice, took over the main share of the vocal duties. This line-up was to last eleven years, the longest period of membership stability in the band's history so far. The new band began a hectic schedule of performing in Britain and the World and prepared material for a new album. The result was the all-instrumental Expletive Delighted! (1986). This showcased the virtuosity of Sanders and Allcock, but perhaps inevitably was not popular with all fans. This was followed by the recording In Real Time: Live '87 which managed to capture the energy and power of the new Fairport on stage, despite the fact that it was recorded in the studio with audience reactions dubbed on. At this point, with Mattacks busy with other projects, the band shifted to an acoustic format for touring and released the unplugged Old New Borrowed Blue as ‘Fairport Acoustic Convention’ in 1996. For a while the four-piece acoustic line-up ran in parallel with the electric format. When Allcock left the band, he was replaced by Chris Leslie on vocals, mandolin and fiddle, who formerly worked with Swarbrick in Whippersnapper, and had a one-off stint with the band replacing Ric Sanders for 1992 Cropredy Festival. This meant that for the first time since reforming, the band had a recognized songwriter who contributed significantly to the band's output on the next album Who Knows Where the Time Goes? (1997), particularly the rousing ‘John Gaudie’. By the time of the 1997 thirty-year anniversary Festival at Cropredy, the new Fairport had been in existence for over a decade and contributed a significant chapter to the history of the band. In 1998, Dave Mattacks moved to the US and Gerry Conway took over on drums and percussion. Fairport produced two more studio albums for Woodworm Records: The Wood and the Wire (2000) and XXXV (2002). Then for Over the Next Hill (2004) they established a new label: Matty Grooves Records. In this period the band toured extensively in the UK, Europe, Australasia, Europe, the US and Canada, and staged a major fund raiser for Dave Swarbrick at the Birmingham Symphony Hall. In 1998, members of the band began their association with the Breton musician Alan Simon. Working in collaboration with numerous others, members of Fairport (predominantly Nicol and Leslie) have performed in and participated in the recordings of all Simon's rock operas, including the Excalibur trilogy (1998, 2007, 2010) and Anne de Bretagne (2008). 2007 was their fortieth anniversary year and they celebrated by releasing a new album, Sense of Occasion. 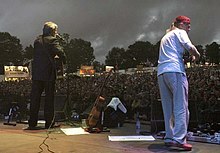 They performed the whole of the Liege & Lief album live at Cropredy, since 2004 renamed Fairport's Cropredy Convention, featuring the 1969 line-up of Dave Swarbrick, Ashley Hutchings, Dave Mattacks, Simon Nicol and Richard Thompson, with singer-songwriter Chris While taking the place of Sandy Denny. Footage of the festival, although not the Liege and Lief performance, was released as part of a celebratory DVD. The band's first official YouTube video appeared in April 2008. Edited from footage shot for the DVD, the nine-minute mini-documentary includes interviews with Lulu, Jools Holland, Seth Lakeman, Mike Harding, Geoff Hughes and Frank Skinner. In 2011, the band released a new studio album Festival Bell, the first new album in four years. This was followed in 2012 by Babbacombe Lee Live Again recorded live during the 2011 tour revisiting the Babbacombe Lee album first issued in 1971. In 2012, the band also released By Popular Request, a reworking in the studio of a number of the most popular songs in the band's repertoire (as determined by a mysterious consultation and voting process conducted by the band with its fans). In January 2015, four years after their previous studio album of original material (Festival Bell), Fairport Convention released a new one entitled Myths and Heroes. The mainstream media has increasingly recognized Fairport Convention's historical importance. They received a "Lifetime Achievement Award" at the 2002 BBC Radio 2 Folk Awards. In the same year Free Reed Records, an independent label, released Fairport Unconventional, a four-CD boxed set of rare and unreleased recordings from the band's 35-year career. At the 2006 BBC Radio 2 Folk Awards they received an award when their seminal album Liege & Lief was voted 'Most Influential Folk Album of All Time' by Radio 2 listeners. At the 2007 BBC Radio 2 Folk Awards Fairport Convention received an award recognising the late Sandy Denny and the band for ‘Favourite Folk Track Of All Time’ for Who Knows Where the Time Goes?. ^ a b Observer Music Monthly retrieved on 14 January 2009. ^ a b Humphries, pp. 7–9. ^ a b Humphries, p. 27. ^ "Inside Fairport Convention's Liege And Lief: "We were on a crusade..." - Page 2 of 6". Uncut. 3 June 2016. Retrieved 26 December 2018. ^ a b Hutchings, Ashley. Liege and Lief. 2002, Island Records reissue, IMCD 291 / 596 929-2, liner notes. ^ a b BBC 2 Folk Awards 2006 retrieved on 13 January 2009. ^ a b BBC 2 Folk Awards 2007 retrieved on 13 January 2009. ^ Fairport Convention, The Cropredy Box (Woodworm, WR3CD026, 1998) disk 2. ^ a b "'You had to hold on to the furniture when Sandy sang': Live fast, die young ... John Harris pays tribute to the one-woman maelstrom that was Sandy Denny". The Guardian. 5 May 2005. Retrieved 17 January 2013. ^ Thompson, Dave (December 1983). "Fairport Convention". Record Collector (52): 28–32. ^ Humphries 1997, pp. 6–7. ^ Ray Foulk, 2015, Stealing Dylan from Woodstock, Medina Publishing, Surbition. ^ C. James, ‘In a lonely moment’ retrieved on 14 January 2009. ^ "Richard Thompson: Solitary Life". BBC Four. BBC. Retrieved 14 September 2012. ^ Sweers 2005, p. 89. ^ Allmusic retrieved on 14 January 2009. ^ R. Unterberger, Eight Miles High: Folk-Rock's Flight from Haight-Ashbury to Woodstock (Backbeat Books, San Francisco, 2003), p. 157. ^ Sweers 2005, p. 4. ^ Rolling Stone Reviews retrieved on 14 January 2009. ^ Richard Thompson Official Website retrieved on 14 January 2009 Archived 18 February 2008 at the Wayback Machine. ^ The Official Charts website retrieved 18 June 2014. ^ (Mostly) English Folk Music retrieved 13 January 2009. ^ Frame, Pete (1983). The Rock Family Trees, the Development and History of Rock Performers. Omnibus Press. ISBN 978-0-711-90465-1. ^ Redwood & Woodward 1995, p. 14. ^ Redwood & Woodward 1995, pp. 15–16. ^ Humphries 1982, p. 103. ^ a b Redwood & Woodward 1995, p. 18. ^ R. Weissman, Which Side are You On? : An Inside History of the Folk Music Revival in America (Continuum International, 2005), p. 241. ^ Redwood & Woodward 1995, p. 19. ^ Redwood & Woodward 1995, pp. 34–35. ^ NME online retrieved on 13 January 2009. ^ As commemorated in The Cropredy Box triple-CD set (1998). Humphries, Patrick (1982). Meet on the Ledge: A History of Fairport Convention. London: Eel Pie Publishing Ltd. ISBN 0-906008-46-8. Humphries, Patrick (1997). Meet on the Ledge: Fairport Convention – The Classic Years. London: Virgin Publishing Ltd. ISBN 978-0-753-50153-5. Redwood, Fred; Woodward, Martin (1995). The Woodworm Era, the Story of Today's Fairport Convention. Thatcham: Jeneva. ISBN 978-0-952-58600-5. Sweers, Britta (2005). Electric Folk: The Changing Face of English Traditional Music. Oxford University Press. ISBN 978-0195174786. Mand, Andreas. "Fairport Convention". Rock Stories: Fifty short stories about music and their significance. Langen – Mueller Verlag. ISBN 978-3-7844-3195-6. Wikimedia Commons has media related to Fairport Convention.